He was the last to extend the papal territory, last to practice nepotism on an extensive scale. He established a vast arsenal in the Vatican, expended vast papal funds to bring polymaths like Athanasius Kircher to Rome, patronized the arts in grand style; monies spent on famous painters like Poussin and Claude Lorrain and architects Bernini and Borromini. He summoned Galileo to Rome in 1633 to recant his beliefs. His pontificate covered twenty-one years of the Thirty Years' War such that his policies largely determined the outcome of that great struggle; a balance of parties which favour his own independence and strength as the temporal power in Italy. He was Pope Urban VIII.  Adapted from the Wikipedia article "Pope Urban VIII"
Galileo and Pope Urban VIII had both drawn a line regarding the science of the heavens, though in the end, it was Urban's that would prove to be the much stronger and more permanent one and a line that Galileo would eventually be forced to cross back over. Yet, in the beginning, Urban had given some leeway to Galileo's ideas, for many of his discoveries were absolute, incontrovertible fact. Still, Galileo dared to ignore the line altogether, asserting theories as unquestionable, some given without any further proof than his own belief in them. For Pope Urban, this was a matter that had both personal and political consequences; by this time in the early 17th century, the church had already lost a considerable amount of its power and while she struggled to retain what was left, Galileo's sheer will of character alienated many well-known and well-placed individuals of his day, including his one time friend, patron and member of the Barberini family, Pope Urban himself. This set into motion the circumstances that were nothing more than a battle of wills, eventually becoming one of history's most famous trials, one whose verdict would remain upon Galileo Galilei till the end of his days, resonating well into the 20th century to become a telling history called The Age of Galileo. In this respect, Galileo would certainly inherit his father's forthright nature in both writing and deed. 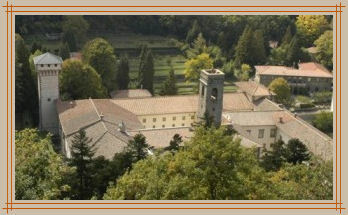 It was during the middle of 1579 that Vincenzo's wishes regarding his son's education came to the fore; Galileo seems to have been rather attracted towards the religious life of the monks at Vallombrosa, entering the order as a novice in that year. This was disconcerting to his father who desired a far more profitable career for his son and so, when Galileo became afflicted with ophthalmia in 1579, Vincenzo used it as an opportunity to withdraw him from the monastery school of Vallombrosa. Having withdrawn his son from Vallombrosa, Galileo's father now had to choose a school as well as a discipline that was not only "profitable" but one that was also in keeping with the skills and interests that Galileo had displayed a propensity towards: a scientific career. In addition, there was the fact that though of nobel family, Vincenzo held no property nor was his income of any sizeable amount. After some thought, Galileo's father, laying aside the idea of having his son become an apprentice in the cloth trade (a fairly stable business in 16th and early 17th century Florence -fn2) and stretching his finances to their limit, decided on the profession of medicine; music and mathematics having already proven themselves to be of little value as far as a profitable career was concerned. So it was that on September 5th, 1581 Galileo was sent back to the city of his birth, taking up residence with a relative named Muzio Tedaldi and enrolling at the University of Pisa. In 1582, at the age of eighteen, Galileo made his first discovery, one that eventually lead to his principles of pendulum motion. 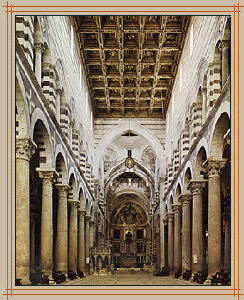 The famous incident occured during his devotions within the Cathedral of Pisa, shown in the image at left, which is a view of the Nave toward the Apse. An attendant, having to reach a particular lamp suspended from the ceiling in order to light it, drew the lamp towards him and after accomplishing his task let it swing back into place. Though the incident was probably one that had been repeated countless times, it caught Galileo's attention long enough for him to ponder upon the lamp's motion versus its time through the arc. 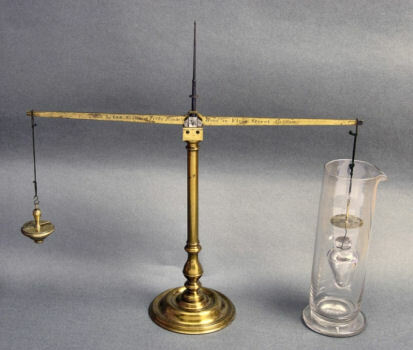 Using his own pulse as a rough timing device, Galileo found that the period of swing remained almost exactly the same, even as the lamp lost energy and the size of the swing became smaller. Though it would remain in the future for Galileo to develope a serious line of experimental work and writings based on this principle (1602), it is our earliest example of his scientific thought on motion and hence, the world around him; the early beginnings of a mathematical approach towards the physical nature of his enviroment and a means of exactness in one's description of how things work. Image courtesy San Antonio College: Ancient to Gothic Art History. With his father's tacit approval all the leeway needed, Galileo forged ahead into the world of mathematics, with his studies of Hippocrates and Galen taking a back seat to Euclid's Elements, as well as works from the great scientist of antiquity, Archimedes (though it seems Galileo only fully began earnest studies of Euclid and Archimedes upon his return to Florence in the following year). By 1584, Galileo was in his third year at the University of Pisa but the financial situation of his father was even more precarious than ever and his family had, by this time, grown larger. As a result, Vincenzo applied, as he had done previously, to the Grand Duke, Ferdinando I de' Medici for one of forty free places or scholarships founded to aid the students of the poor or poor scholars (a concept similar to that aid received by Kepler in 1591 at Tübingen). Again, as had resulted in previous attempts at such, a scholarship was denied Galileo, due in no small part to his own attitude and character which garnered him neither sympathy nor aid, be he poor or otherwise. For Galileo "the Wrangler", this marked the end of his education in Pisa and in 1585, it was decided that he withdraw from the university and so returned home to Florence without having obtained a degree. 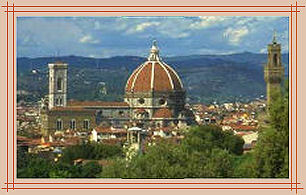 Galileo was now twenty-one years old and back home in Florence where he would remain over the next four years. He applied himself with great verve to the study of mathematics, once again tutoring under his friend Ostilio Ricci who continued his studies of Euclid and Archimedes, the latter of which provides us with another insightful glimpse into Galileo's own method of analysis and another of his inventions, the hydrostatic balance, a device consisting of an equal-arm balance in which an object is weighed first in air and then in a beaker of water to determine its specific gravity. Image left, looking down at Florence. It is most famously attributed to the ancient Greek scholar Archimedes; he reportedly proclaimed "Eureka!" when he stepped into a bath and noticed that the water level rose  he suddenly understood that the volume of water displaced must be equal to the volume of the part of his body he had submerged. This meant that the volume of irregular objects could be calculated with precision, a previously intractable problem. He is said to have been so eager to share his realisation that he leapt out of his bathtub and ran through the streets of Syracuse naked. Extrapolating from Dante's line that "[the giant Nimrod's] face was about as long and just as wide as St. Peter's cone in Rome," Galileo deduced that Lucifer himself was 2,000 armlengths long. 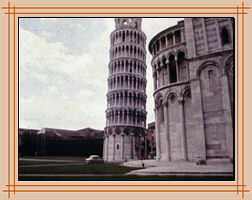 The audience was impressed, and within a year and a half, Galileo had received a three-year appointment to the University of Pisa, the same university that ironically, he never graduated from! 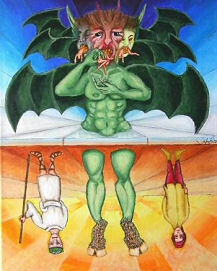 At right is an image of the great Nimrod (Canto 34) and is courtesy Fisher Arts, part of a larger panel (88" x 42" Acrylic) showing Dante's Inferno and used with the kind permission of Duane Fisher. In 1587, the Italian city of Rome found itself in the midst of a major remodelling effort initiated by its benefactor, a soft-spoken Franciscan friar who, in 1585 became Pope Sixtus V. Finding himself the inheritor of a bankrupt Vatican treasury, ecclesiastical states that were rife with lawless brigands and 140,000 inhabitants in need of growth away from the banks of the flood prone Tiber River, Sixtus set himself to the task of renewing the physical appearence and layout of the city that was home to Catholic Europe's highest ecclesiastical seat. Though his pontificate would last a mere five years, his achievements within such a short time period, though financially unsound, would be only the more remarkable. It was during the middle period of Sixtus' urban renewal, in the autumn of 1587, that Galileo decided to take his first visit Rome and though we have no record as to the purpose of his visit, Galileo did meet with Christopher Clavius, a mathematician and astronomer best known for his lead in reforming the calendar into its present day form; the Gregorian calendar of 1582. 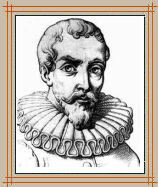 Born in Germany c.1538, Clavius joined the Jesuit order in 1555, attended the University of Coimbra in Portugal and thereafter, moved to Italy where he studied theology at the Jesuit Collegio Romano in Rome. By the time of Galileo's arrival there, Clavius had become a well respected and renown mathematician as well as the Professor of Mathematics at the Collegio Romano. 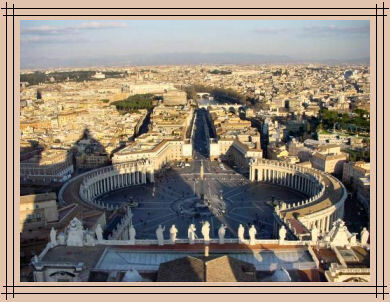 Seen above is Saint Peter's square in Vatican City, viewed from the lantern of Saint Peter's. Courtesy Travel Adventures. My wish regarding Pisa, about which I wrote your lordship, will not be carried out; for I hear that a certain monk, who lectured there formerly, and then, on being made General of his Order, retired, has resigned the Generalship, and has again taken to lecturing; and that his Highness has already appointed him to the post. Moreover, the appointment was only for three years, but renewable. But, any port in a storm; and in Galileo's needy circumstances, even this wretched salary was not to be rejected; besides, the office would enable him to make something in addition by private tuition. Galileo was now twenty-five and a half years old and had finally achieved what was most desirous to him, a professorship. Yet, it is certain that if Galileo was anything, it was ambitious; it is also clear that Galileo's indomitable and at times, stubborn character, while wholly beneficial to his physico-mathematical research, were anything but endearing to those who occupied long-standing positions around and above him. These traits were to prove, over the long run, the most disadvantageous to Galileo; their ability to alienate both friend and foe alike saw their beginnings at this time and they would continue until, whatever truth lay behind their inception, began to be seen as the attack of a cantankerous upstart rather than the steady hand and pen wielded in the name of enlightenment and progress. Yet, as this lay much in the future, we will proceed to look at Galileo's rise to fame over the next twenty-five years in the following chapter. 2. See: Munro, John H. (2005): The woollen cloth industry in Italy: The rise, expansion, and decline of the Italian cloth industries, 1100  1730. Published in: Il Rinascimento italiano et l'Europa, vol. IV: Commercio e cultura mercantile 1 4 (2007): pp. 105-141. 3. In dealing with the terms "Scientific" and "Experiment" as applied within the 16th and early 17th century, both would hardly be recognized, if at all, as we today define them. The word science: " Modern sense of "non-arts studies" is attested from 1678. The distinction is commonly understood as between theoretical truth (Gk. episteme) and methods for effecting practical results (tekhne), but science sometimes is used for practical applications and art for applications of skill. Main modern (restricted) sense of "body of regular or methodical observations or propositions ... concerning any subject or speculation" is attested from 1725; in 17c.-18c. this concept commonly was called philosophy." The terms "scientific revolution" is from 1803; "scientific method" is from 1854; "scientific notation" is from 1961. As to the term Experiment, it is the consensus amongst leading authorities and biographers of Galileo that much of his experimentation was the result of discoveries made out of systematic or logical thought rather than real world experiments. One must also be mindful that the Scientific revolution had only a precarious start in 1543 with Nicolaus Copernicus's De revolutionibus orbium coelestium and did not again see the light of day until the the expansion of this and other theories through the efforts of those like Kepler, Galileo and Newton, as well as through the work of others during the 17th and 18th century periods. Sources: 1) Douglas Harper's Online Etymology Dictionary © November 2001 2) How did Galileo discover the law of free fall? Nagarjuna G. Homi Bhabha Centre for Science Education Tata Institute of Fundamental Research, Mumbai, INDIA 3) Scientific revolution. The article is a precis on historical science from the online encyclopedia website Wikipedia. Clerke, Agnes M. (18421907), article Galileo Galilei Italian physicist and astronomer (1564-1642). Also for the quote in following paragraph above, beginning "His favourite pastime..." Miss Clerke made astronomical observations at the Cape of Good Hope, 1888; gained the Actonian Prize for her works on astronomy, 1893 and is the author of A Popular History of Astronomy during the Nineteenth Century and Problems in Astrophysics. © 2005-09 1902 Encyclopedia. All Rights Reserved. Fahie, J. J., 1846-1934 Galileo His Life and Work London Murray 1903. Digitizing sponsor: MSN, Book contributor: Gerstein - University of Toronto, Collection: Toronto. p.8 Online version available Internet Archive: Free Download Evidence reported by Katie Lawson for item galileohislifewo00fahiuoft on December 5, 2007: no visible notice of copyright; exact publication date unknown. Eureka (word) "Eureka or "I have found it" is an "...exclamation used as an interjection to celebrate a discovery." Archimedes, from Wikipedia. November 4, 2009. Drake, Stillman Galileo at Work Dover Publications Inc., Mineola, NY, 1978, pp. 1617. SARA ELIZABETH BOOTH and ALBERT VAN HELDEN The Virgin and the Telescope: The Moons of Cigoli and Galileo. Science in Context 13:3-4, 463 Online publication date: 1-Feb-2000. 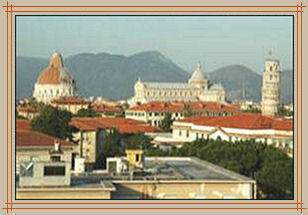 The Sixteenth-Century Mathematics of Italy: Commercial Mathematics from the Mathematics History website. This is an interesting website page that, grammical errors aside, nicely presents the historical characters involved, from Oriemtal mathematics to present day. It appears to be based upon the work of Howard Eves, Lee Woo-young and Sin Hang-gyun (translation) of: An Introduction to the History of Mathematics, Seoul: Kyung Moon Publishing, 1995. See: Howard Eves' textbook: An Introduction To The History of Mathematics. A well written and informative textbook containing everything you wanted to know about mathematics. Shea, William & Artigas, Mariano The Galileo Affair Unpublished text, January 2006. Made available through the Creative Commons distribution licensing and presented at the University of Navarra  Group of Research on Science, Reason and Faith. Unless otherwise stated, all images, screen shots, electronic materials including instructional, software, scripts and web pages referred to herein or incorporated by reference are copyrighted © by their respective owners. None of the content herein may not be reproduced or copied in any manner from this website without the prior written permission of above indicated copyright holder(s). All images and orginal works of the author(s) used within the above or foregoing web pages are for the sole purpose of information and display at A Universe in Time website and have been used with the kind permission of the respective owner(s).